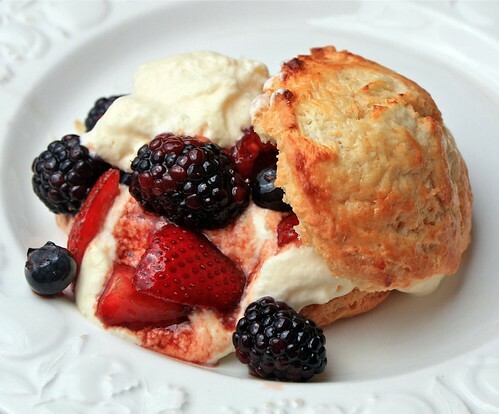 I suppose you could convince me there is a dessert that typifies summer more than shortcake, and you might be able to string me along for a while before I came to my senses to explain delicately that, at least to me, not much else can compete. 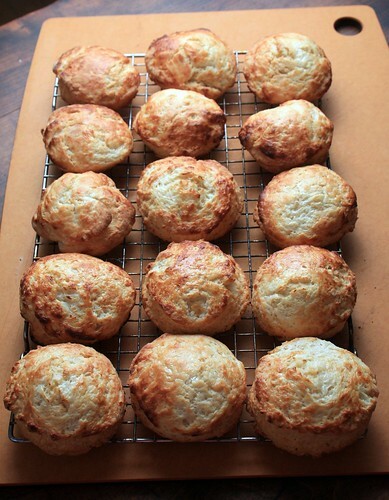 My shortcake memories go back years, but they always begin the same: with a biscuit. Not a slice of angel food cake, or pound cake. A lowly biscuit. One that, if you’re me, would normally be found on a plate filled with beans, rice, and coleslaw. That kind of biscuit. The one that not much else can compare to when it comes to soaking up juice and binding everything together, whether it’s dessert or not. Sure, I’ve tried a variety of recipes, combinations of flavors and ingredients, but in the end I’m only truly satisfied with that slightly salty bite of biscuit and the tart sweetness of fresh berries tempered by the richness of cream. It’s fabulous. 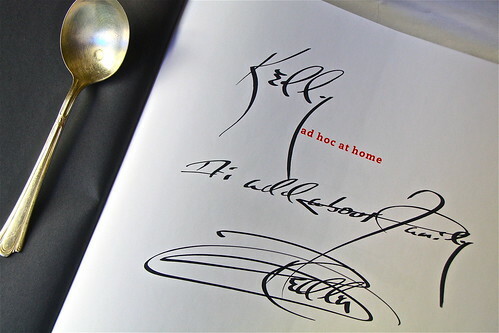 Recently, my husband surprised me with Thomas Keller’s latest book, ad hoc at home. He’d heard that the man himself would be visiting a local Williams-Sonoma so decided to wait on his lunch hour in a rather lengthy line to get Keller’s signature for me. Not only was I touched by the gesture, I couldn’t wait to dig into the recipes. You know what it’s like to get a new cookbook. You leaf through the pages, savoring each possibility, wondering what might measure up to your expectations without killing yourself on the first attempt: buttermilk fried chicken…rubbed and glazed pork spareribs…iceberg lettuce slices…No, it was the buttermilk biscuits that got my attention first. I have to admit I did go back to the iceberg lettuce slices (you have to try his Blue Cheese Dressing), but the biscuits are what I first settled down to make knowing instantly they were destined for berry shortcakes. Think about it. They’re perfect for the picnic of all summer picnics — July 4th. You make them the day before, cool them completely before sealing their crispy freshness away so you can split them and then dollop on some cream and berries that have had a chance to sit for a while to develop a lovely, syrupy juice. There is an art to this if you want to take some time with it, and if you’d like to consider another ingredient you may never have tried before which is perfect with berries, try mascarpone. I’m partial to mascarpone, so when I saw that Keller included it in a recipe for peaches and cream, I had to try it giving it my own spin, of course. If you’re thinking that it may not travel well, think again. With a few recycled jars filled and kept in an ice chest, you’ll be able to turn out the perfect summer dessert for your July 4th holiday, courtesy of inspiration from Thomas Keller, of course. Whisk the dry ingredients in a large bowl. Add the chilled cubes of butter and with your fingers, “pinch” them into the dry ingredients until the mixture resembles a coarse meal with chunks no larger than the size of small peas. 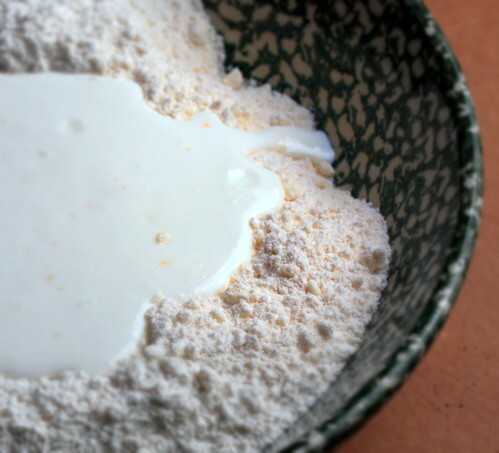 Add the buttermilk and with a wooden spoon, gently stir and “lift” the mixture, slowly working in the flour until all dry ingredients are dampened. The mixture will be quite wet. On a surface lightly dusted with flour, pour out the dough and with flour dusted hands, pat out a 3/4″ loose rectangle. Dust a glass or biscuit cutter with flour and press into the dough, removing each piece onto a parchment-lined baking sheet. Gather the bits and pieces together gently and press to repeat the process until all the dough is used. Lightly brush the dough cutouts with buttermilk and bake for at least 15 minutes or until biscuits are a golden brown in color. Remove the biscuits when done to a rack to cool completely. 1/2 c. mascarpone or cream cheese, room temp. With a standing mixer, whip the egg whites until they are foamy. Add half the sugar gradually with the motor running until stiff, glossy peaks form. Scrape out into a bowl and reserve. In the same mixer bowl, add the egg yolks and the remaining sugar and whip until the mixture is very pale and thick. Whip in the mascarpone until well blended and scrape into a large bowl to reserve. Clean the mixing bowl and whip well, and pour in the heavy cream. Whip until soft, medium peaks form. Add the lemon zest and juice and mix. Add this creamy mixture to the egg yolk mixture by thirds, carefully mixing to lighten it before the next third is added. Add the whites a third at a time, folding carefully so as not to deflate them. When all are incorporated, cover with plastic wrap and chill for at least 2 hours, or overnight if possible. Hull the strawberries and quarter them. Add the blueberries and blackberries to a large bowl and mix with the strawberries. Sprinkle over 2 T raw sugar and gently toss. Splash with balsamic vinegar if desired and cover, allowing to sit at room temperature for at least 30 minutes before serving. 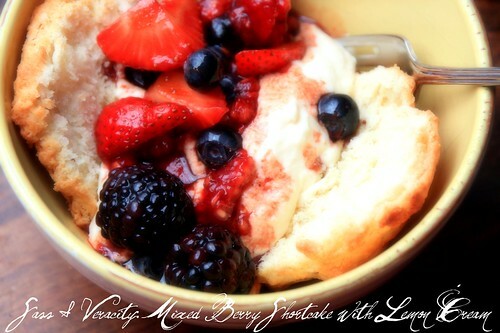 To serve, split a biscuit, dollop on a large spoon of lemon mascarpone cream, then pour over the berries and juice. Cap the dessert with a biscuit top and serve. This recipe was inspired by Thomas Keller’s ad hoc recipes. I loved these biscuits. Keller makes them in a food processor, but I’m so used to just pinching the butter between my fingers, I didn’t bother to get out my Cuisinart. The key to the butter is to cut it into small squares and briefly freeze them. 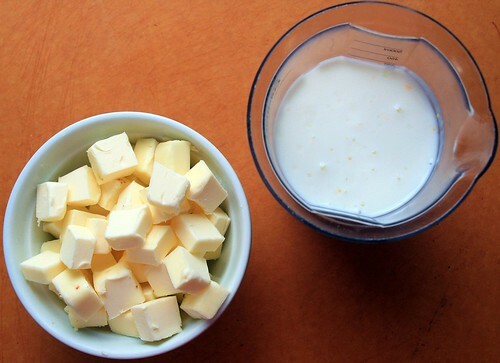 The butter needs to stay as cold as possible when mixing. These biscuits are salty, and that’s what makes them so good. Wow. Definitely brush on the buttermilk before baking. It makes an amazing crust on the biscuits. I guess I should mention if you’ve not already noticed that raw egg goes into this lovely lemony cream mixture, so for those who need notice, there it is. Don’t balk on the splash of balsamic vinegar in the berries. It enhances the flavor perfectly! If you’re brave enough, add a sprinkle of basil chiffonade and mix it in. Not only is it beautiful, it’s tasty. Truly, decadently light and delicious. You might get creative and use small jars to create individual desserts. The biscuit goes first in the jar then screw on the lid. When it’s time to serve, the lemon cream and berries can be added. 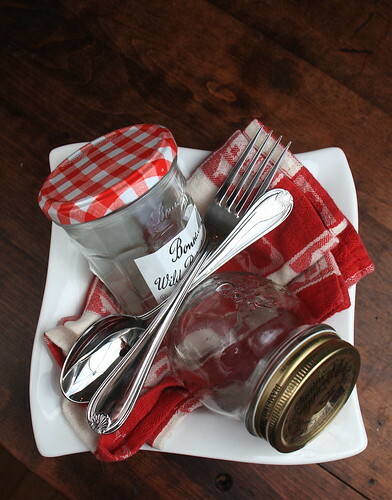 If you have to take this dessert on the road, then just pack up the parts in jars and chill well until you need them.